It’s ignorance and a lack of education that keep us from addressing our problems. But we can educate ourselves, we can make others aware and we can make a change – big or small. I’ve hardly taken a single breath, it seems, and already the week has passed me by. After today, there will be no more waking up to the sound of my roommate’s footsteps in the morning. There will be no more stepping outside to feel the warm sunshine on my skin, no more eating Mexican food in CCIDD’s dining room, and no more days of service at Juana’s house. After today, we will go home to the noise of the city, and fall back into the routine of our busy lives. 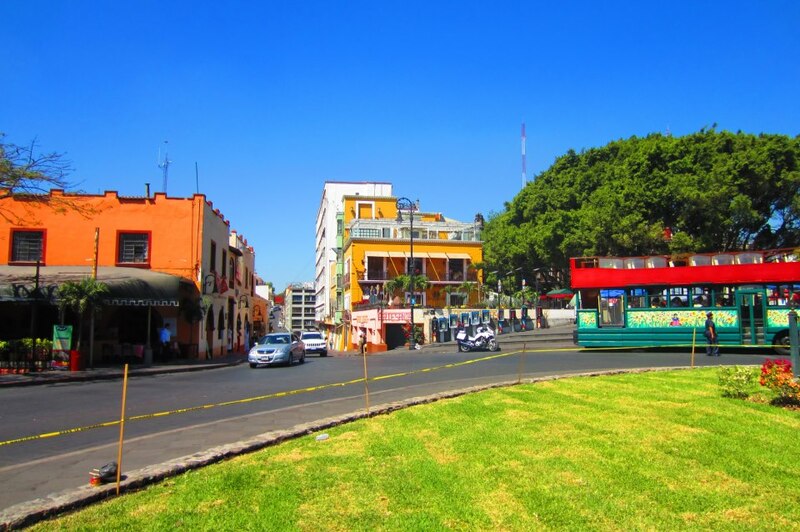 But for today at least, we have one last chance to enjoy Cuernavaca. After breakfast, my team and I split up into the same groups as we had at the market earlier this week. This time we got to explore the central plaza and be tourists. We must have done two or three circles of the place, stopping every two feet to run our hands across all the handcrafted bracelets laid out on blankets along the pathway. The entire place was exploding with colour and the voices of families offering goods to passersby. I could have spent hours looking at all the crafts and appreciating the care with which they were made. I dragged my friends to a vendor selling tacos, and within moments, my trip to the market was complete. Ever since then, I’ve been missing the deliciousness and spice of those tacos, so warm and crispy, filled with chicken, potatoes and the essence of Mexico. The spice was so powerful it had my nose running and eyes tearing. Though it could have just been the emotion of eating something so incredible. I really can’t say. 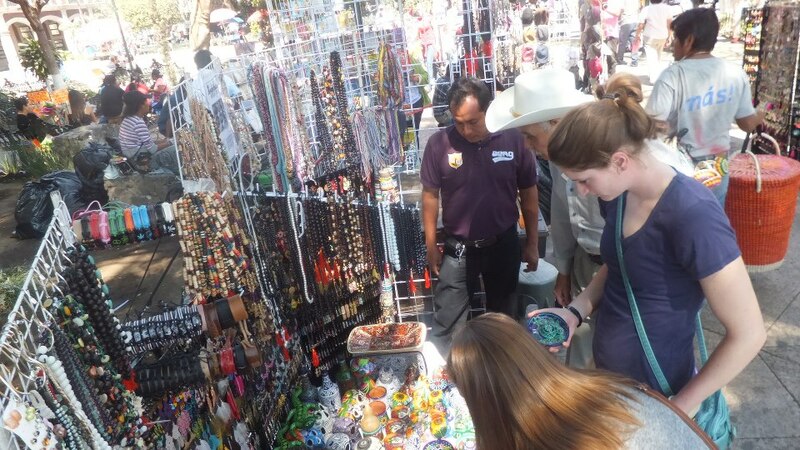 My favourite part of our trip through the market though was speaking to a man who was selling copper jewelry on the corner of the plaza. When I kneeled down to admire the blue stone he had carefully set in the chain of copper links, he began talking to me in Spanish. Funny thing was — I could actually understand what he was saying! I was so excited by this that we ended up having a lovely – albeit short – conversation about my trip, where I’m from, and how he felt Canada was a very beautiful country. The spontaneity of our conversation and the interest he showed in talking with me despite the fact that my Spanish is very minimal absolutely made my day. It reminded me how much I will miss the friendliness of the people here. It was even harder to go back to CCIDD that afternoon, knowing that I was seeing the plaza for the last time. Back at the compound, we spent the afternoon talking with the UBC and McMaster students about the social issues we learned about this week. All this reflection got everyone questioning what we could do to build on our experience once we get home, and how we could share it with everyone that couldn’t be here. As my team and I sat around the table in CCIDD’s dining room, I realized how strong of a unit we had become in a matter of days. While hardly anyone wanted to speak up at our pre-departure sessions in the fall, now it was almost impossible to give everyone a chance to be heard. There was such enthusiasm at the table that afternoon, and the passion in everyone’s voices showed me just how much Cuernavaca had impacted us. We set goals and talked about how to continue helping the families we had met this week. For starters, we would send them some of the photos we’d taken on our service days. But we wanted to do something more concrete than that. We thought about the lack of tools we had access to this week, and how many more homes could be built if we all had the ability to contribute. Maybe, we hoped, if we raised money to send to CCIDD, they could buy more tools, buy more materials, and be able to improve more houses at a faster pace. We wrote “fundraising” down on our plan, and we decided we must tell our story to as many people as possible when we get home. As one of my teammates said, it was great that we were able to help a couple of families through our small contribution, but it was not enough. Thousands of other families will continue to live in the destitute conditions of La Estación, and the CCIDD will be able to help just 14 of them improve their living conditions this year. Yes, we should be happy with what we did this week, my teammate acknowledged. But she couldn’t help feeling angry at an economic system that puts people in these conditions, and the lack of awareness both in our own community and in Cuernavaca about the reality those people face every day. At reflection this evening, we learned that a young man from the local community had joined one of our service teams at their site today. He’s lived in Cuernavaca his entire life, but has never stepped inside the walls of La Estación. He grew up thinking the squatter’s village is a dangerous place, filled with people he shouldn’t associate with. After working on one of the projects today, he told us how shocked he was to see the living conditions. He never knew about the problems that exist here, or the kindness that the people have. It is ignorance and a lack of education that keep us from addressing our problems with concrete action like this young man did today. But we can educate ourselves, and we can make others aware, and we can make a change – big or small. And there’s no telling where its ripple effect will end. As we sat in a circle at our closing reflection tonight, the CCIDD staff presented us all with beaded necklaces as a thank-you. As they placed one over each of our heads, they whispered something that set my heart on fire: Go forth and seek truth, justice, and compassion. As Anne Frank so eloquently said, “We all live with the objective of being happy; our lives are all different and yet the same.” The experience I’ve had in Cuernavaca this week could not have been more illustrative of this statement. And moving forward, it is a lesson I know my team and I will never forget. I am confident that when we leave tomorrow, the impact this experience has on us will only continue to expand. Rather than dwell on the fact that we can no longer be at CCIDD, we will go forward and “seek truth, justice, and compassion.” In fact, the goals we set for ourselves today tell me so.